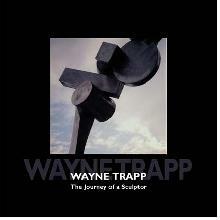 Wayne Trapp: The Journey of a Sculptor only looks like a coffee table book. It is in fact, much more: a nonlinear autobiography of a poet, a laborer, and a seeker. It is story as meditation. It deserves to be read, not browsed, from start to finish. / Trapp's enormous repertoire of sculpture, painting, and drawing has begged, for decades, to be catalogued. The works themselves -- voluptuous and emphatic -- tell of a sometimes expansive, sometimes encumbered life. Each piece, from the imposing monoliths forged in steel to the sparest, most intimate brush drawings, put spirit first. They, and their maker, over the forty years chronicled here, thrive through the best and the worst of times. / The photographs and the excerpts from the artist's journals flow in seamless dialogue between one another. At once adamant and inquisitive, Trapp's life and work are revealed here as a graceful struggle. Journey reads like a novel. Near the end is a full-page self-portrait captioned "These eyes have seen too much." The spent, disheveled visage halts the reader. Trapp chose colors from a jangly, late-night pallet: fuschias, rich blues, tropical yellows, vermilion, purple. The caption might easily continue: ... "but never enough." / Dancingfish Press (TM) Editor Deborah Mayhall-Bradshaw's lyrically combined graphics and printed word are at once antiphonal and in perfect unison. The text and photographs are set against a talky collage of handwritten journal entries; letters; news clips; poems; drawings and diagrams penned urgently on looseleaf pages. The effect is one of being alone in Trapp's studio while he's out doing errands. You're driven to look, read, and touch each vibrant scrap. / Wayne Trapp's work demands utter engagement and compromises nothing. His words are elegant, whimsical, harrowing; and not for the faint of heart. Journey gives back with a stunning largesse. It dares the reader to come along. This is an artist-owned book run that was available for purchase largely through book signings, and galleries representing the artist.